Hibiscus Cocktail Recipe with Easy Homemade Hibiscus Syrup! The first time I discovered hibiscus flowers was when I was travelling in Egypt. Everywhere we went, we were given a drink made with the dried flowers. Usually a strong icy drink (like the most delicious fruit juice ever!) or a warm, weak tea (prettiest shade of pink ever!) Few locals in Egypt drink alcohol, so I had to wait until I got home before I could use the dried flowers to make fancy cocktails. You don’t have to travel to Egypt to get your hands on the flowers to make this hibiscus cocktail. 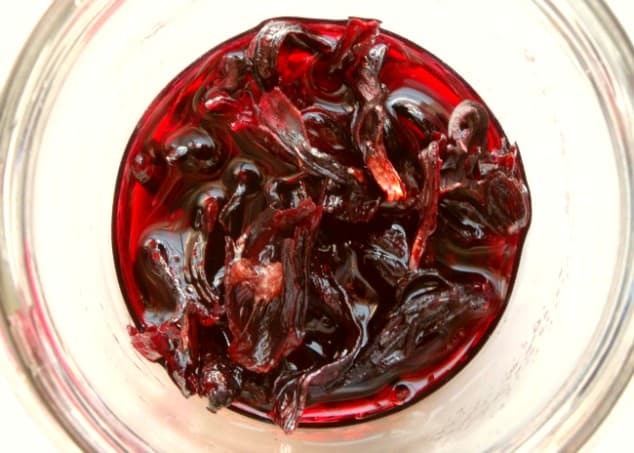 You can buy dried hibiscus flowers on Amazon (for a much better price than I paid in Egypt, might I add) and use them to make hibiscus syrup at home. If that sounds like too much work (it really isn’t – making hibiscus syrup is super-simple and just takes a few minutes!) 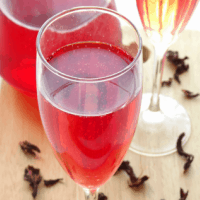 you can take a shortcut and buy ready-made hibiscus syrup online. See all those gorgeous hibiscus flowers in there? They’re absolutely packed full of floral, fruity notes! When you boil them with sugar and water, all the yummy flavours are released from the flowers and concentrated into the syrup. Seriously, this stuff tastes so good you’ll want to stir it into everything. The next time you’re throwing a Christmas get-together and really want to wow your friends and family, grab this hibiscus cocktail recipe and get ready to become the most popular host ever! P.S. What other ways are you going to use your hibiscus syrup? Sweet, sparkly and gorgeous, this hibiscus cocktail is everything a good Christmas drink should be! We've all had our fair share of fancy cocktails, but when you pull this one out the bag, your friends and family are guaranteed to be amazed. Prepare yourself for the oohs, the ahhs and the recipe requests! Place the sugar, water and dried hibiscus flowers into a small saucepan and bring to a boil over a high heat. Reduce the heat to medium and leave to simmer for 15 minutes, until you've got a thick syrup. Stir every few minutes so the flowers don't stick to the bottom of the pan. Leave to cool to room temperature then transfer the syrup with the flowers into a jar and store in the fridge. 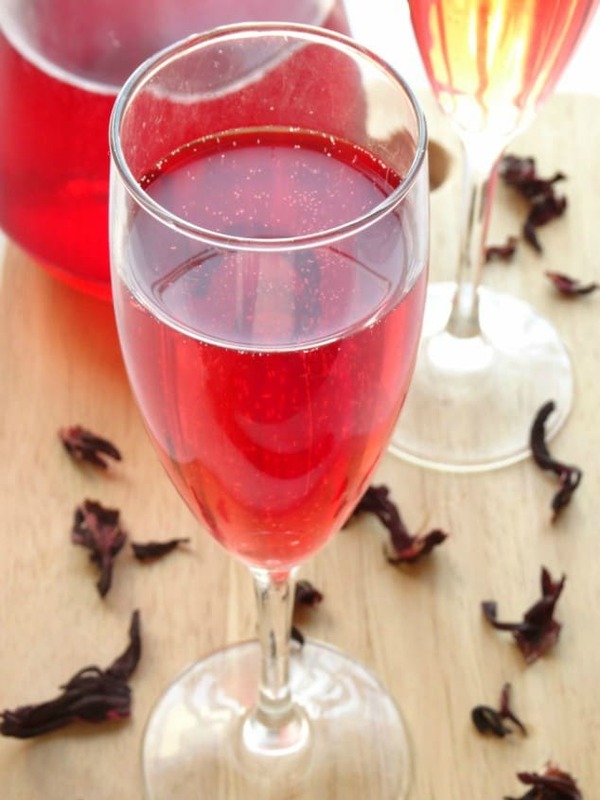 Pour the cava/sparkling wine, vodka, triple sec and hibiscus syrup into a jug and serve! What a great way to use hibiscus – this sounds like a delicious cocktail! Thanks so much, Bintu. It really is wonderful! I recently tried hibiscus tea for the first time a few weeks ago and loved it. I think it would be delicious in a cocktail — and that color is so festive. If you like it in tea, Lisa, you’ll definitely love it in this cocktail! I love hibiscus tea and never thought this adding in a cocktail. And the color is gorgeous! This cocktail truly is sweet, sparkly and gorgeous! Could there be a better combo? 🙂 I’m feeling more festive just looking at these! Such a fun recipe for the holidays. Thanks for sharing! Wow, this sounds incredible, and I love that you can buy hibiscus flowers on Amazon! One more reason to heart my Prime subscription! Cheers to this!